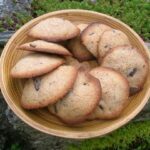 This is a simple recipe for old-fashioned chocolate chip cookies, which were then called chocolate drops. It’s from my first cookbook and is meant to be easy enough for young children to make. This post is a bit of indulgence. I have a heap of posts waiting to be published or written that should be taking priority. But rather unexpectedly, I was able to lay my hands on my first cookbook last night and couldn’t resist baking something from it this morning. Claire at Foodie Quine is to blame for this little renaissance. She got rather excited about finding a copy of her first cookbook, wrote a post about it highlighting a few other first cookbooks and is now hosting an event this month for bloggers to post about theirs. It just so happens that Janice of Farmergirl Kitchen has the very same book as mine – My Learn to Cook Book: a children’s book for the kitchen by Ursula Sedgwick with fabulous and much loved illustrations by Martin Mayhew. We both still have our original copies, although mine resides at my mother’s and we were both given our books as a present from a Great Aunt. Mine was given as a Christmas present when I was eight and I immediately set to and cooked my way through the entire book. I don’t think there’s a recipe there I didn’t attempt, some with more success than others. You can tell which recipes I used a lot by the copious staining on some pages. The page for zoo biscuits is almost completely blue from the food dye I used to paint the biscuits. Some recipes such as the chocolate mousse I carried on using well into my adulthood. Some recipes are frankly, a little bizarre. The fruit fried sandwich, which is two slices of bread sandwiched together with bramble jelly and grated apple and then fried in butter is not something I find immediately appealing. On the other hand, I’ve just made some bramble jelly and I have a house full of apples. So watch this space. 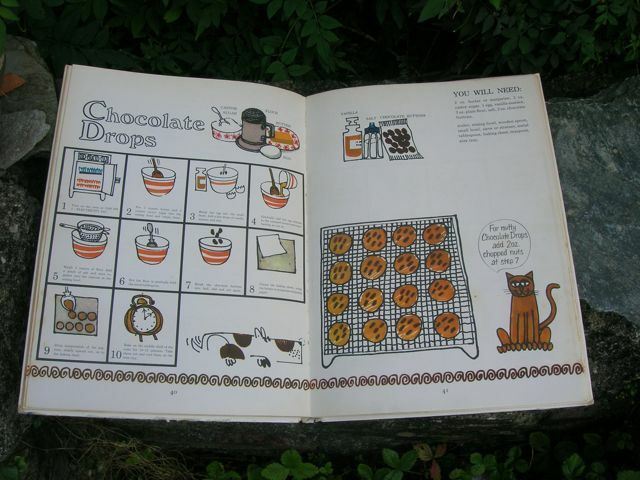 What are your first cookbook memories? I’d love to hear them. A couple of years ago, I made crispy crackolates from the book for the first time in many a long year. This time, I decided to have a go at the Chocolate Drops – more commonly recognised nowadays as choc chip cookies. My version is a little bit more sophisticated than the original. I used wholemeal spelt flour and Willie’s Venezuelan 72% chocolate drops for an added wow factor and because I’d just managed to get some on special offer. If you’re making these with kids, you may want to use milk chocolate drops instead. Although the book gives fairly explicit instructions most of the time, it does let you down on occasion. I had no clue as to how many biscuits the mix was meant to make. As I was in a bit of a hurry and didn’t want to have to prepare more than one baking tray, I heaped mine up into 12 mounds which made for crispy edges and a chewy middle. Sixteen would have made a better and flatter size, but you live and learn or at least that’s what you’re meant to do. 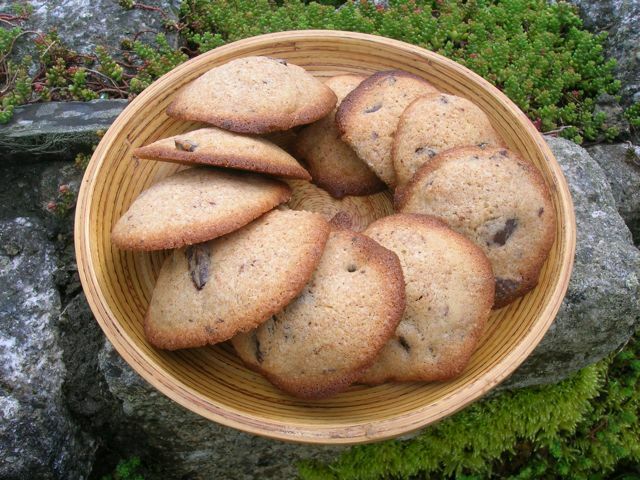 A simple recipe for chocolate drops, now called choc chip cookies. It's from my first cookbook and is meant to be easy enough for young children to make. Cream the butter together with the sugar until light and fluffy. Sift in the flour and salt, then stir until just combined. Bake at 180°C for 12 minutes until brown around the edges and golden on top. For smaller crunchier cookies, make 16 smaller mounds rather than 12. Thanks for visiting Tin and Thyme. If you make these chocolate drops or have memories of your first cookbook, I’d love to hear about it in the comments below or via social media. Do share photos on your preferred social media site and use the hashtag #tinandthyme, so I can spot them. For more delicious and nutritious recipes, follow me on Twitter, Facebook, Instagram or Pinterest. Hm, lovely. My first cookbook doesn’t look that good anymore, although it is not that old … I dare say. It’s about Mexican food. But what a great first cookbook to have. I love Mexican food. Do you still use it Chris? My first cookbook was My Fairytale Cookbook, which had stories and then recipes (apparently Sleeping Beauty ate crisps and dip when she woke up…) but I can’t remember making any of the dishes! You mean you didn’t make loads of gingerbread houses? Sweet! So nice to get children into baking! Looks like a nice and cute book! Thanks Alida – getting kids interested in cooking is so important. The book obviously has good karma Rachel, so fingers crossed. That looks like a good first cookbook. I read a lot of books growing up but didn’t have a cookbook like this. The recipes sound great and these chocolate drops look delicious! Thanks Ros. It felt very grown up to have my own cookbook. Going back to one’s cooking roots and that first cook book is such a trip down memory lane isn’t it ?! My first cookbook was Betty Crocker’s … and I still use it! That’s so good to hear you are still using your first cookbook Susan. I really must dig out my first “adult” cookbook. this cookbook look sweet and beautiful!! Thank you Gloria. I think it would be just as useful today as it was way back then! The illustrations are great in this book and the dog and cat appear regularly throughout. Sorry you didn’t get ot have your own cookbook as a child, I was so proud to have my very own one. Something to think about for Sylvia. I didn’t have a specific children’s cook book as a kid, but loved my Mum’s well-used cooking encyclopedia. I know Mum still keeps it, though it has lost the front cover many years ago. Good to hear your first cookbook is still in use Galina and the fact it has lost it’s front cover shows how well used it is, which is the best compliment you can pay a book. I guess you don’t get to see it very often. Love the idea of going back and baking from your first ever cookbook – although it sounds like quite an odd one! But not as odd as Mr Twit’s beard food. I think you should definitely find a copy and make this Nat – whatever it is!!! I googled it, apparently it involves mashed potato, hard boiled eggs, mushrooms, hotdogs and a load of other random ingredients! I’m not too tempted, have to be honest… Bruce Bogtrotter’s chocolate on the other hand, that could be worth revisiting! 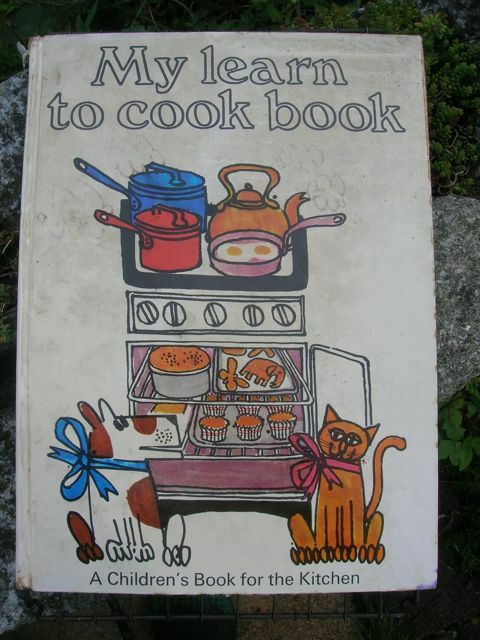 I too have this book and the follow up My Fun to Cook Book – they are fabulous and I loved them dearly as a child (still do). Many of my first cooking attempts were from these books! Lovely to hear this Anna. I have a feeling I might also have My Fun to Cook Book too> I will have to do some investigating. Oh how lovely. What a great book. I don’t know if it was a great book Kath, but it was a much loved and a much used book. You were obviously a lot more dedicated and industrious than me! I used to look at the pictures and dream of Baked Alaska, oh come to think of it, nothing much has changed, I still read cookbooks more than I actually cook from them. Lovely to see your copy is still around too, I think we probably kept it as it was such a beautiful book. I think I kept it, because I’m rubbish at throwing things out, but it is a lovely book and the illustrations are fantastic. Do you mean to say, you never attempted that Baked Alaska Janice? Lovely post that has bought lots of great memories of my own first experiments in the kitchen, thanks to the Usborne ‘My First Cookbook’ book! Do you still have it Kate? I think these books have a lot to answer for and have made us all baking mad. Mine was the Usborne First Cookbook – the one with the tiny chef army being hoisted into place to stir, mix, grate etc. Oh go get it Ruth and bake something for a real nostalgic trip down memory lane. Aaah what a blast from the past – I remember that book so well!